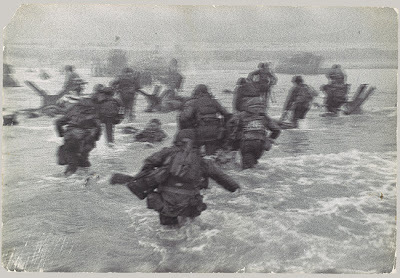 On June 6th 1944, Allied forces commenced on the largest amphibious invasion and assault in recorded history as more than 160,000 personnel landed on five beaches of the Normandy coast in the opening assault on Hitler's supposedly impregnable Festung Europa. The liberation of western Europe had begun. Here's the link to the Wikipedia entry, even though there's no way that an encyclopedic article could possibly convey the full scope of Operation Overlord: something that had never been done before and Lord willing, will never be needed again. But to those who did, who waded ashore on Normandy so that others might be free - and especially to those among them who never came back home - this blogger can only give the most reverent of respects. Been thinking about WWII a lot this week. Running sound for a production of "The Hiding Place." I have a high respect for my grandparents generation. Their faith, service, and sacrifice. There were problems in that generation (racism, etc.) but so much good to learn from. Let us never forget . . . .